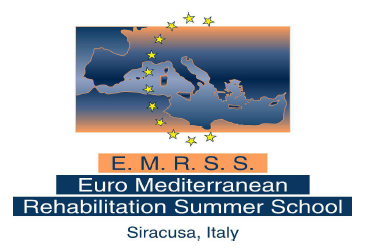 We have just concluded the 10th edition of the Euro Mediterranean Rehabilitation Summer School which was attended in Syracuse by young Doctors specializing in Physical Medicine and Rehabilitation from all the countries of the Mediterranean. The course traveled on two tracks, one purely scientific and a representative one. For the latter, there have been several events beginning with the celebration of the tenth anniversary of the School with the participation of representatives of scientific societies at the international level as the Professor Jorge Lains, Nicholas Christodoulou, Xanty Mikhail, Rolf Frischknecht, Amparo Assucena, Raffaele Gimigliano, Alessandro Giustini, Vincenzo Saraceni. Scientific topics have covered all the new technologies in rehabilitation. In particular, during the four days of work at the Hall Borsellino of the Palazzo Vermexio, have addressed the issue of musculoskeletal ultrasound, a theme that international personality in the field, Prof. Levent Ozcakar; from his report come up how with the proper equipment, shown to the students directly, it is possible to study all diseases and muscle tissue associated with it, such as vessels and nerves. He addressed the issue of remote rehabilitation, a new technology that allows a rehabilitation program developed and monitored. This issue was addressed by Prof. Mauro Zampolini. Prof. Matteo Cioni addressed the problem of the evaluation with specific instruments oh hypotonia and muscular hypotonia due to disability. Also in the field of diagnostics applied to the field of rehabilitation has been treated by Professor Peter Marano the issue of the use of electroencephalography and by Dr. Michael Vecchio the issue of Electromyography and injections of botulinum toxin in spasticity. Interesting was also the report of the Study Group of the University of Naples under the leadership of Prof. Francesca Gimigliano who dealt with the issue of osteoporosis. The final day saw an overview of all that advanced technology has made and will make available to the rehabilitation: among these the functional magnetic resonance imaging used to diagnose diseases that do not involve alterations to the structures of the human body but changes. This functions until yesterday could not be detected and therefore also treated with another new technologically advanced equipment as Transcranial Magnetic Stimulation: the route was shown by Eng. Francesco Infarinato.